With holiday shopping now in full swing, many residents of Southern California are now finding that their bank account is just a little bit smaller than what they would like. This makes any accidents or problems with a vehicle a painful proposition. Because of this, PG Los Angeles Auto Glass Repair is now offering discounts on all auto glass repair and auto glass replacement services during this season of giving. When it comes to maintaining a vehicle, especially when a budget is tight, car owners have to make tough decisions about what is necessary and what can be put off. Unfortunately, this leads to many drivers neglecting to contact a mobile auto glass repair and replacement company when the inevitable cracks and nicks begin to appear on a windshield. With the cold winter months wreaking havoc on auto glass, this decision could lead to some major problems down the road. For those that have ever let their damaged auto glass go unfixed, watching a crack slowly grow across the entire length of the windshield is a common sight. This increased damage can happen for a multitude of reasons ranging from drastic changes in temperature to hitting potholes on the road. What could have been a quick repair at one point may now mean the driver needs to find a mobile auto glass replacement company. 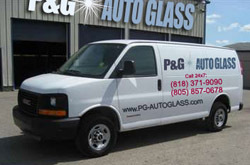 As the leading business for auto glass repair in Los Angeles, PG understands that drivers need convenient and affordable products. Their fleet of vehicles is available 24 hours a day, 7 days a week, for calls anywhere in the greater Los Angeles area. To add just a little bit of holiday cheer to already low prices, they are also offering an additional discount of $10 for all auto glass replacement in Los Angeles. For any driver that has been putting off repairs or replacements to their auto glass, the time to fix this problem may be now. PG has remained the leading Los Angeles auto glass replacement company for a reason, and they are now hoping to make their hassle-free services just a little bit easier this holiday season.